Sovos is the largest and most experienced private filer of 1099 forms filed to the IRS, with more than three decades of reporting experience. NetSuite’s longest-trusted tax partner, Sovos has more than 5,000 clients worldwide and is trusted by all of the “big four” accounting firms. NetSuite is discontinuing its 1099 reporting capability and recommends Sovos as your future vendor. As of NetSuite version 18.2, NetSuite will no longer support 1099 reporting functionality for tax year 2018 and beyond due to constant changes in regulatory requirements. But NetSuite customers don’t need to panic. Fortunately, tracking and automating regulatory updates, as well as facilitating 1099 reporting efficiently and securely, is exactly what Sovos has done for years. Knowing Sovos’ expertise in 1099 reporting, NetSuite recommends its customers use Sovos as their 1099 reporting solution. 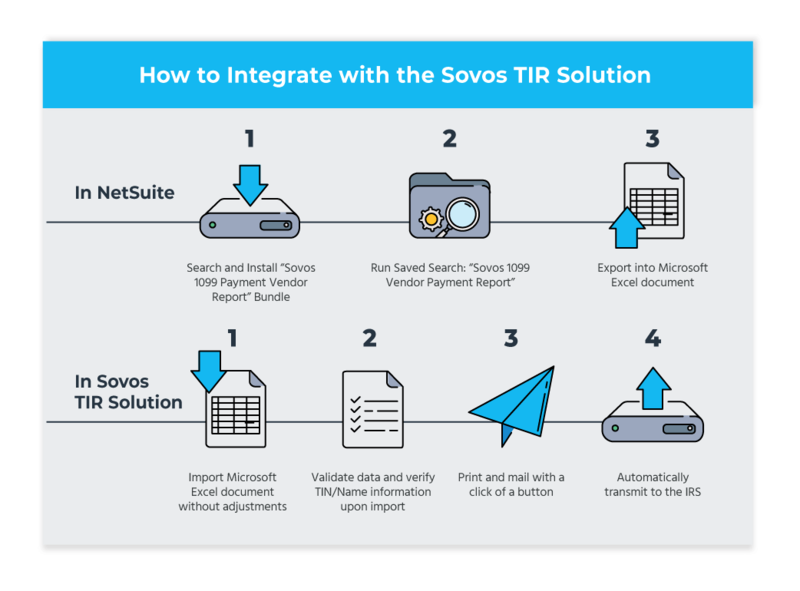 Sovos has created a bundle within NetSuite that offers integrated 1099 reporting capabilities. Relieve stress — we’ll stay on top of regulatory changes, so you don’t have to. Instill peace of mind with a successful transition in 1099 reporting vendors. Take control of compliance, freeing AP professionals from unwanted tasks and allowing them to play a more strategic role in the organization. Streamline compliance-related tasks, bringing greater operational control and efficiency, and reduced costs. Reduce risk by enabling your organization to move more nimbly in reaction to regulatory change. How can you get Sovos 1099 reporting capabilities? Fill out the form on the right to watch our demo and learn more about how the Sovos 1099 Reporting software can help you.